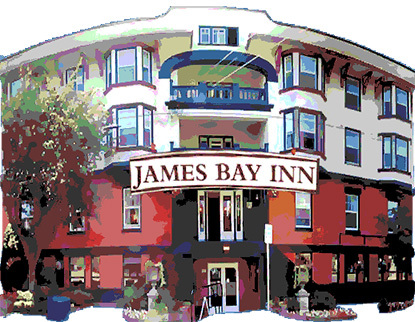 Member meetings — other than special events — take place from 7 to 9 pm in the Windsor Pavilion, 2451 Windsor Road, Oak Bay. 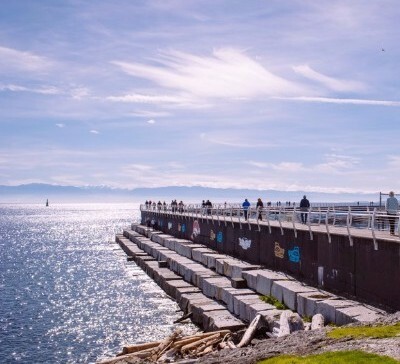 Join fellow PEAVI-ites at 10:30 a.m. on Saturdays at Ogden Point's Breakwater Cafe for the best views in town, delicious breakfasts and excellent company. It's March, which means it's time for some fun! Meet with fellow PEAVI-ites to share laughs, stories, and ideas, over a drink and a meal in a cozy atmosphere. Please email workshop@peavi.ca with the topic that most interests you for this spring's workshop. Feel free to just type the topic into the subject line and press send with no message. And if you have any suggestions, please send them our way. The workshop topic that interests me is . . . The February member meeting saw 32 people turn out for Don Gorman's excellent presentation on book promotion and, in addition to taking home a whole lot of valuable information, several lucky door prize winners each received a lovely book from Rocky Mountain Books and Heritage House. Thank you, all! Don stressed that in an environment where reviewers and librarians are inundated with books and where getting reviews is difficult, authors need to be strategic, focused and realistic. These were his top ten points. 1. Ensure there’s a market for the book. 2. Choose the right publisher, i.e. do the necessary research. 3. Find the right title and subtitle for the book. Including keywords in the titles is important for discoverability. 4. Create a clear and concise synopsis. Tell readers exactly what the book is about in about 50 words. 6. Know the media and who the influencers are. 7. Know the retailers. Consider both traditional and non-traditional outlets. 8. Engage with social media — regularly. This is extremely important because social media is one area where authors can control their own stories. 9. The author should include a link to the book in their email signature. 10. When talking to the media, always mention the title of the book. Working with new technology in industries and media beyond traditional print publishing is the new normal for many of Canada's editing professionals. This theme is at the heart of the latest edition of Professional Editorial Standards, the vital publication for editors by the Editors' Association of Canada (Editors Canada). This new edition, which was approved by members of Editors Canada in October 2016 and took effect January 1, 2017, is now available as a free download at http://www.editors.ca/publications/professional-editorial-standards. The updated Professional Editorial Standards reflects the knowledge and skills required of editors today, taking into account technological advances and current working methods. "We're thrilled with this latest edition of our cornerstone publication," says Editors Canada president Anne Louise Mahoney. "We literally set the standards for professional editing in Canada, and we are committed to keeping them current to reflect the important work that editors do." Professional Editorial Standards clarifies what is expected of Canadian editors and defines the criteria against which their knowledge, skills and practice can be measured. The standards reflect the growing demand for editing in non-traditional publishing and increasingly digital environments. As a result, they are designed to be broadly applicable to all editors, regardless of the type of material they work on, the media and formats they work in, or how they edit. They represent a shared set of core standards that all Canadian editors are encouraged to follow. The 2017 Editors Canada Conference takes place June 9–11 at the Crowne Plaza Gatineau–Ottawa, in the heart of the National Capital Region amid the Canada 150 celebrations. 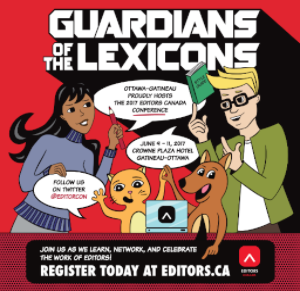 The theme for Conference 2017 is Guardians of the Lexicons. The conference will open Saturday morning with a keynote address by Métis writer Cherie Dimaline, and wrap up on Sunday afternoon with American editor, professor, and blogger John McIntyre. Register for Conference 2017 online or by downloading a printable form and mailing it in. Early-bird pricing is in effect until Monday, April 10. The early-bird fee to attend both days of this year's conference is $395. As of April 11, the two-day fee will be $475. Do you have a story to share about an interesting project or a new job? Has a book you edited recently been published? We'd love to hear your editing news. Do you have content, ideas, or feedback you'd like to share, an idea for a monthly meeting topic or a suggestion for a particular speaker? We're all ears! Please contact Lynne Graham at communications@peavi.ca. Copyright © 2017 Professional Editors Association of Vancouver Island, All rights reserved.